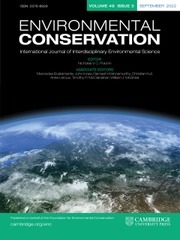 Environmental Conservation is one of the longest-standing, most highly-cited of the interdisciplinary environmental science journals. It includes research papers, reports, comments and subject reviews addressing environmental policy, practice, and natural and social science of environmental concern at the global level, informed by rigorous local level case studies. The journal's scope is very broad, including issues in human institutions, ecosystem change, resource utilisation, terrestrial biomes, aquatic systems, and coastal and land use management. The journal is essential reading for all environmentalists, managers, consultants, agency workers and scientists wishing to keep abreast of current developments in environmental science. Brazil’s Native Vegetation Protection Law Jeopardizes Wetland Conservation: A Comment on Maltchik et al.